If your spine didn’t have curves, it wouldn’t be nearly as strong as it is. The spine has an incredibly important job to protect our body’s nervous system. About 10% of the population has a 6th lumbar vertebrae. Scoliosis affects 2-3 percent of the population, or an estimated six to nine million people in the United States. As we age, the space between our spinal bones get smaller. This is why you notice people get shorter as they get older. 80% of the population will experience back pain in their lives. The number one disability for workers is related to spinal injuries. Humans are born with 33 spinal bones with a “C” shaped spine, but wind up with 26 bones and an “S” shaped spine as adults. The tailbone received the name “coccyx” from resembling the beak of a cuckoo bird. If it wasn’t for the perfectly designed structure of your spine, you wouldn’t be able to bend, drive a car or dance. 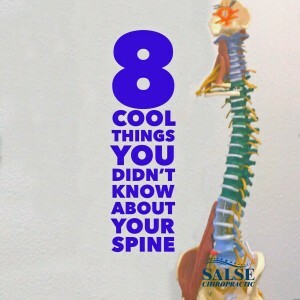 That’s because the spine is not one big backbone, but it is actually divided into small segments to allow for movement while protecting the spinal chord. The reason that chiropractic is so good for the spine is because spinal adjustments can remove nerve interference caused by spinal segments shifting out of their normal alignment. This can result in a lowered state of health. Therefore, it would be a benefit to everyone to get a spinal health exam.